Continually adding a variety of new, used, and rare items. on a 1" x 1" grid. POSSIBLY USED, acquired through school surplus, made in USA. 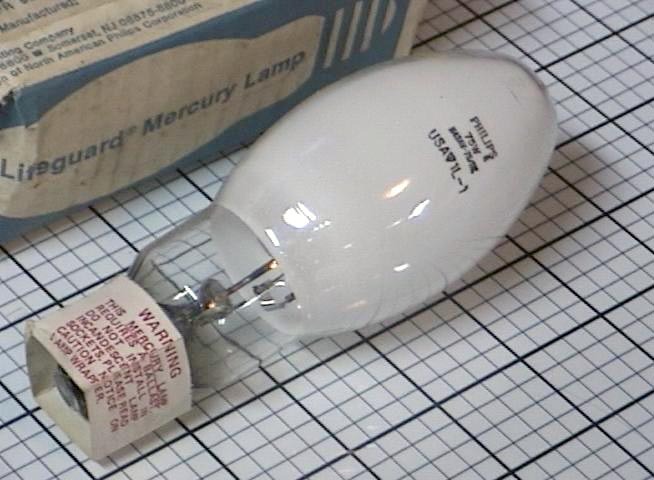 Listing is for one (1) each mercury vapor lamp, Philips H43AV-75/DX, 75 Watts, rated 24000+ average life (hrs), proper ballast required for operation, comes exactly as shown in the photo. Item shows no signs of use. Item may show some signs of use. Expect only minimal wear or blemishes. Item shows moderate signs of use. May have scratches or imperfections. Is functional to the best of our knowledge. Item shows heavy signs of use. Expect scrapes, markings, dents, etc. Possibly impaired function (see product description for details). May be missing useful parts. Item is for spare parts only. Packaging has no marks or blemishes. May have some writing or price tags on it. Packaging shows moderate signs of wear. Expect some scratches, markings, bent corners, or discoloration. Packaging shows heavy signs of wear. Expect obvious imperfections or superficial damage, etc. Expect large rips, tears, or crumpling, etc. Packaging is included because it might have useful information on it. To ask us a question about this product, click here.